For years, Dr. Wallach has been recommending gelatin as part of the Pig Pack Formula. Ultimate Gluco-Gel™ contains a 1:1 ratio of gelatin and glucosamine sulfate, a key building block of bone matrix, cartilage, ligaments, tendons, and connective tissue. 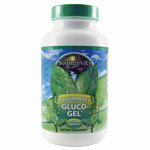 Ultimate™ Gluco-Gel™ is the ultimate way to get your daily dose of gelatin and healthy joint support. For best results, use Ultimate™ Gluco-Gel™ as part of a full nutritional program that also includes Majestic Earth® Ultimate Classic®, Majestic Earth Plant Derived Minerals, and Ultimate™ Daily. * WARNING: If you are pregnant, nursing or taking medications, consult your healthcare professional before using this product. This product contains an ingredient derived from shellfish. KEEP OUT OF THE REACH OF CHILDREN. DIRECTIONS: Take 2 capsules, two times a day, or as directed by your healthcare professional.